As many Syrian families are unable to afford to buy essentials, Muslim Aid Jordan recently distributed ‘educational parcels’ which includes school bags, uniforms, stationary (notebooks, pens and geometric equipment), crucial for enrolling at any public school in Jordan. A recent needs assessment conducted by Muslim Aid found one of the most urgent needs to be met now, is the welfare of children living in refugee camps. Of the 70,000 Syrian refugees that are registered in camps in Jordan, around 17,500 are children who lack essentials to facilitate their educational needs. As many Syrian families are unable to afford to buy essentials, Muslim Aid Jordan recently distributed ‘educational parcels’ which includes school bags, uniforms, stationary (notebooks, pens and geometric equipment), crucial for enrolling at any public school in Jordan. 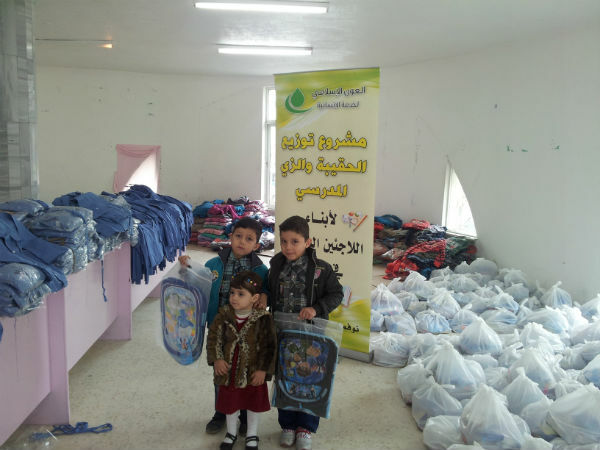 Children in the Alza’tary, Al Hussein, Al Ramtha and Zarqa camp were overjoyed and thankful to receive the educational parcels. Past projects have also included establishing two medical clinics in Al Rathma and Al Marfuq, Jordan, to support the growing influx of Syrian refugees in desperate need of medical attention.